Brief Loves that Live Forever (translated by Geoffrey Strachan) is a beautiful little book which looks at love in a cold climate (Russia…), in particular the way that we tend to overlook our shorter moments of happiness. 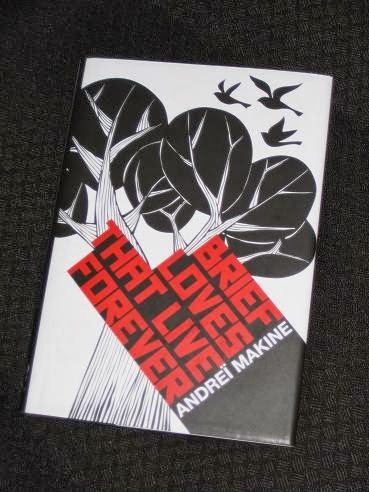 Makine, through his narrator, argues that in our quest for permanent, everlasting love, we ignore the fact that a single moment of happiness can actually provide us with a lifetime of warmth, and his book takes us through several of these moments in the narrator’s life. What follows are half-a-dozen episodes from the narrator’s life, in chronological order, each describing a short moment of happiness from the past. From the image of a beautiful crying woman encountered in his childhood, a moment which first taught him of the existence of real women, to a platonic friendship with a young woman in a drab town; from a brief, passionate summer affair by the sea (and under a political hoarding…) to a stroll through an orchard with an old friend. Each of the moments marks an important landmark in the narrator’s life, and while none of them lasted for long, all of them have made a deep impression. What makes Brief Loves that Live Forever more than a simple tale of lost loves though is the fact that there is a parallel story running through the novel. Makine may be telling the reader about his character’s lovelife, but it’s about more than that – a lot more. Each of the stories is set against the backdrop of the political events of the time, giving us several snapshots of the Soviet society and regime. It’s the kind of writing I enjoy, and there’s a lot more of this in the novel. I read Makine's Life of an Unknown Man and really liked it. I have a couple more of his sitting here too, but not this one. This sounds a stunner. Love the idea of the snippets of memories created through single experiences. I would love to buy it right away but I am really going to focus on the thousands of TBR books I already have for 2014. Have a happy holiday. I have enjoyed your posts. Guy – He was a fairly new name to me, but not to many others it seems! Many have suggested 'Le Testament Français' as one to try too. He's one of those extraordinary, intense writers totally dedicated to his art. Glad you enjoyed this – sounds like my kind of book, will have to (sigh!) add it to my list. Just found 'Music of a Life' (La musique d'une vie) by him at the local library, so I've borrowed that for the holidays. I just love the fact that he had to pretend his books were translated from Russian in order to get published in France.